Bold, bright colors attract our attention from a distance while intricate patterns of color become visable when we step closer. 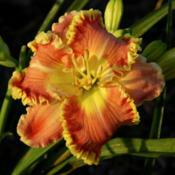 Written descriptions and images on a plant label, a hybridizer's catalog or a registration database can further complicate our understanding of a daylily's true color. 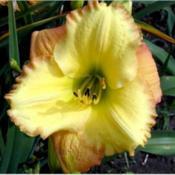 Other factors such as soil, temperature, partial shade or full sun can alter a daylily's color giving a different appearance from one garden to another or from day to day within the same garden. 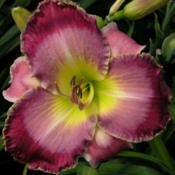 Assisting us in sorting through the complexities of daylily color are terms relating to the placement of color and the color patterns seen in different areas within the bloom. The color of one area can compliment or contrast with another, producing different color combinations which may enhance the attractivness of the flowers. 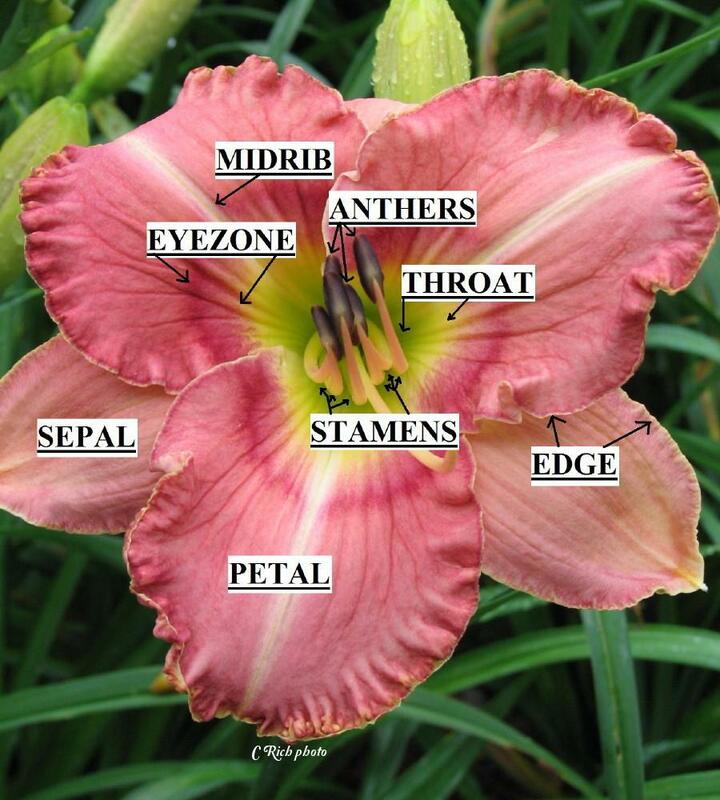 The parts of a daylily bloom, including the throat, anther, petal, sepal, eyezone, midrib and edge are areas where these color differences may occur. 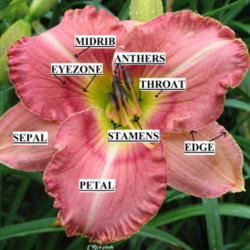 The centermost area of a bloom is the throat. 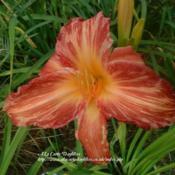 The throat contains the stamens and pistil and is where we begin to see color on the petal segments. 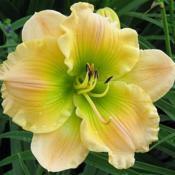 The most common colors described for the throat portion of the petals are yellow, yellow to green, green and occasionally gold, melon or orange. 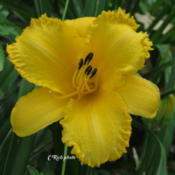 Filaments, the stem portion of the stamen, may be the color of the throat portion of the petal, a lighter shade of this color or include the color of the area just above the petal throat. 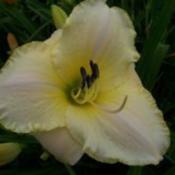 Anthers, the pollen containing sacs at the tip of the stamens, are most often white, pale yellow or black. 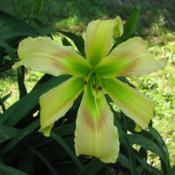 A green throat is seen here in the cultivar Magic of Oz (Herrington H. 1995) while Mandarin Firecracker (Rich 2008) has an orange-pink throat. The filaments of Stenciled Impressions (Stamile 2002) include lines of color seen above the throat and Arctic Snow (Stamile 1985) shows the sharp contrast of black anthers against near white petals. The surface of the petals and sepals, the tepal segments, is where the majority of the color occurs on a bloom. 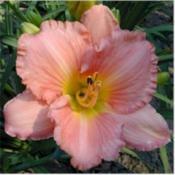 A bloom with both the petals and sepals the same shade of a single color is referred to as a self. A self may have a throat of a different color as seen in Red Volunteer (Oakes 1984) or the throat may be the same color as the petals and sepals. 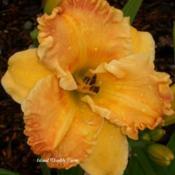 The daylily Three Rivers Gold (Otte 1994) is a bloom with petals, sepals and throat all the same color and can be referred to as a complete self. 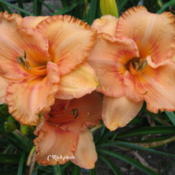 Daylilies registered as a blend or polychrome are single colors comprised of a mixture of two or more colors on their petals and sepals. 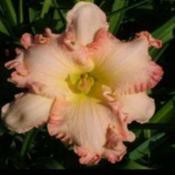 Pat Neuman (Trimmer 1998) and Waterfall Rainbow (Hanson 2005) are both registered as blends which exhibit the mixing of two colors, Pat Neuman (Trimmer 1998) being a pink cream blend and Waterfall Rainbow (Hanson 2005) an attractive blending of pink and orchid. When the petals and sepals are a single color, which is a mixture of three or more colors, the color is often referred to as polychrome. 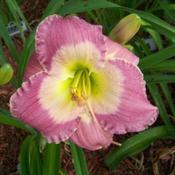 Our Friend Sally (Carpenter 2002), Leisure Time (Branch 1995) and Nancy Ligon (Rice 1998) are all registered as polychromes. Bitone, reverse bitone, bicolor and reverse bicolor are very unique colorations. 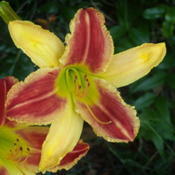 In a bitone the petals are a darker shade and the sepals a lighter shade of the same color. 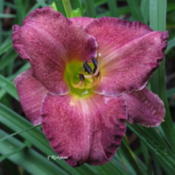 The daylilies Lavender Potpourri (Stoll 2006), a lavender bitone, and Momentum (Olsen 1996), a tawny rose bitone, both have the darker shade of the primary tepal color on their petals. 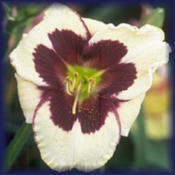 With a reverse bitone the sepals are the darker shade and petals the lighter shade of the same color. 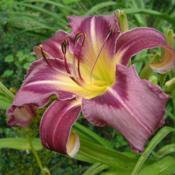 Sangre De Cristo (Stamile 1998) is a pink reverse bitone and Satin Bird (Childs 1982) a violet purple reverse bitone. 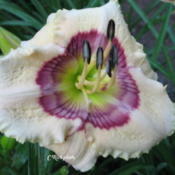 Bicolor blooms have two completely different colors, a dark color on the petals and a light color on the sepals, as seen in the cultivars Alien Force (Gossard 2010) and Harpie Lady (Gossard 2008). 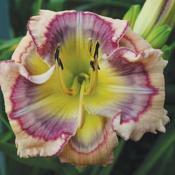 Blue Beetle (Gossard 2010) has darker pink sepals and lighter cream petals and is registered as a reverse bicolor. 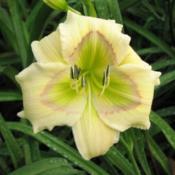 Also registered as a reverse bicolor is the cultivar Unique Style (Carpenter K. 1985) which has yellow petals and rose sepals. 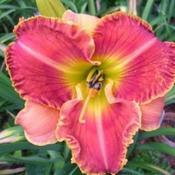 Some of the most exciting color combinations can be found in daylilies with contrasting color within the eyezone or with an all over color design or pattern. 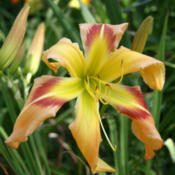 The eyezone is a place for color which circles the bloom just above the throat. 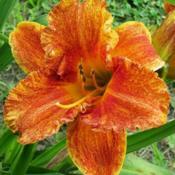 An eyezone has a different color or colors, or shades of color than the primary color of the petals and sepals. Different terms are used for the type of eyezone depending on the shade, color or placement of color within the eyezone. 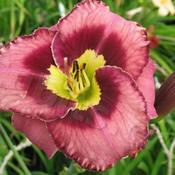 When a darker color or shade of color circles the throat on the petals only, the eyezone is referred to as a band. Little Leprechaun (Stamile G. 2007) and Square Dancer's Curtsy (Payne L.H. 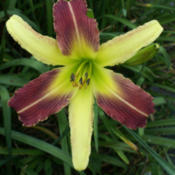 2001) have a band of a different color on the petals only. 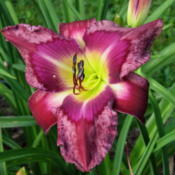 When there is a darker color or shade of color circling the throat on both the petals and sepals it is called an eye. 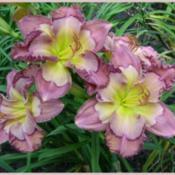 Piano Man (Trimmer 1998) and Adorable Tiger (Rasmussen 1998) both have the darker eyezone color on the petals as well as the sepals. 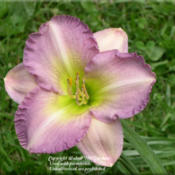 The cultivars Paul Stout (Kirchhoff 1998) and Coyote Moon (Kirchhoff 1994) both have an eyezone that is a faint or barely visable darker shade of color which circles the throat on the petals. This type of eyezone is referred to as a halo. 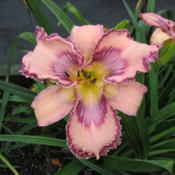 An eyezone that is a lighter shade of color than the primary color of the petals, as seen in Lake Lure (Sellers 2001) and Captivating Smile (Rice 2005), is known as a watermark. 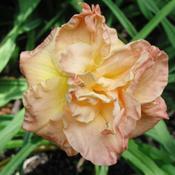 Two new terms and definitions for variations of color were recently added by the American Hemerocallis Society, applique and pattern. 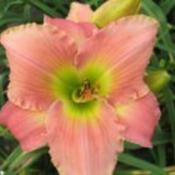 The definition of applique from the society is "Applique, Applique Throat: In a daylily bloom, an applique color pattern originating in the throat and extending outward onto the midrib and tepal surfaces. 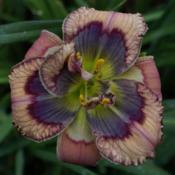 The strong contrast and sharp distinct edge of an appliqued throat show no color bleeding into the surrounding petal tissue." 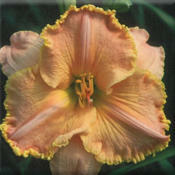 The cultivars Chinese Scribe (Munson R. W. 1991) and Catcher in the Eye (Kinnebrew 2001) both exhibit this newly defined type of throat and eyezone. 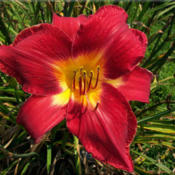 The second definition is for pattern and reads as follows from the Dictionary of Daylily terms on the society's website. 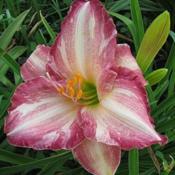 "Pattern, Patterned: A daylily that exhibits variations in hue, value, or saturation of the base, midrib, or throat color, in such a way that a design is created beyond that of a bold or solid eye, band, halo or watermark, with or without simple picotee edging. 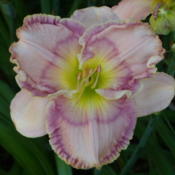 This type of "patterning" includes but is not limited to, daylilies with concentric rings or feathering of color within the eyezone or elsewhere. It excludes selfs, simple bitones and simple bicolors. " Cosmic Kaleidescope (Carpenter 2006), Marilyn Morss Johnson (Morss 2007), Screen Pattern (Stamile 2005), Jerry Hyatt (Hanson 2004), Westbourne Childhood Memories (Meadows M.J. 2005) and Little Trooper (Stamile G. 2008) are cultivars that show a few of the various designs of placement, color combination and shades of color seen in patterned daylilies. Two other terms for patterns of color are stippled and striped. 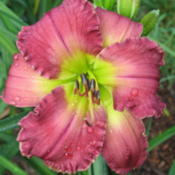 A stippled daylily has small clusters of cells of a different color than the base color of the tepal segments, giving a freckled, speckled or dotted pattern as seen in Kaleidescope Fantasy (Morss 1995) and Spacecoast Freaky Tiki (Kinnebrew 2006). 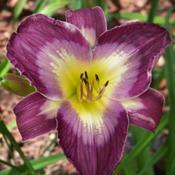 Daylilies with a stripe pattern have stripes of at least two different colors or shades of a color which extend outward from the top of the throat toward the tips of the segments. 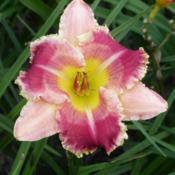 Two examples of striped daylilies are Pink Stripes (Derrow 2006) and Lovely Margie (Lovell 2005). The edge or outer margin of the tepal segments is another place for color. The color of an edge can be the same as the segments in a self, Atlanta Southern Beauty (Petree 1991), can mimic the concentric rings of color seen in an eyezone, Windswept Dreams (Salter 2007), can be a darker shade of a color or a completely different color than the primary tepal color as seen in Cranberry Zinger (Rogers C. 2005) and Oh So Awesome (Salter 2008). We can remove some of the mystery of color description by using the appropriate terms for placement of color. 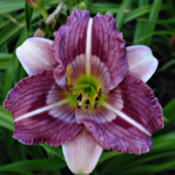 Referring to a bloom as purple and white takes on a different meaning when described as purple with a white edge, white with a purple eye, purple with a white watermark or a purple and white bicolor. 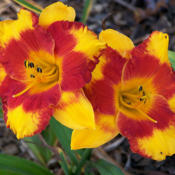 The daylily provides us with a rainbow of color choices. With the language for color placement we can navigate the full spectrum of the rainbow. 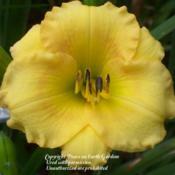 Author's note: For the official terms and definitions related to color in daylilies please visit the registration guidelines and Dictionary of Daylily Terms on the American Hemerocallis Society website. 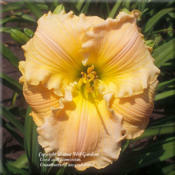 The definitions included here for Applique, Applique Throat and Pattern, Patterned are by copyright of the American Hemerocallis Society, Inc. All Rights Reserved, used with permission.